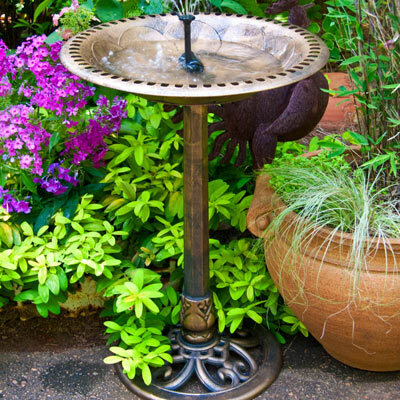 Our Mini Solar Fountain provides a refreshing spray that will attract birds, while aerating the water to keep it cleaner. It comes with a solar pump and three different fountain heads. 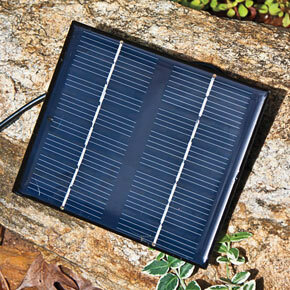 A 128-inch cord allows the solar panel to be in the sun while the bird bath is in another location. No operating costs! The pump works only in sunlight; it measures 5" high, with a base 2" wide and 1 7/8" deep. Solar panel is 5" x 5 7/8". Birdbath not included.